อีสาน /i-săan/ the nickname for Northeastern Thailand is the largest region in the country. Isan food is available in almost every corner especially “ส้มตำ Som Tam” (green papaya spicy salad) which is popularly consumed across the whole country, not just in the Northeast. When you travel to Bangkok you will likely come across a local from Isan, majority of taxi drivers are Northeastern and you will probably hear Isan pop music from their radio. The differences between Isan dialect and the central dialect is only some words, the structure of the language is exactly the same. 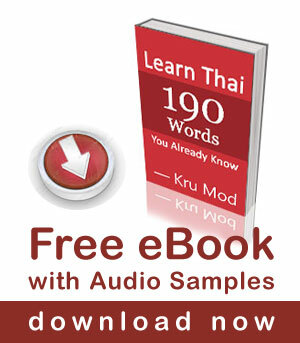 If you have basic knowledge of central Thai language already, learning to speak Isan should not be very tricky. As what you will learn from this video – the word “บ่ bàw” which means ‘not’ is the main Isan word that are used throughout the conversation however other vocabulary are the same as central Thai. สั่นหน่ะ /sàn-nà/ is ถ้างั้น /tâa ngán/ in central Thai which means “in that case”. Great Lesson! Thank you !! !